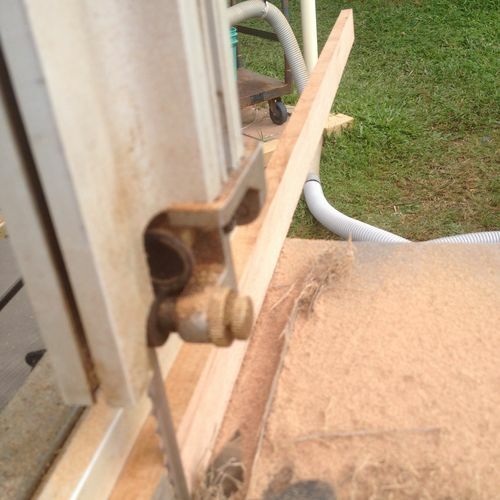 I saw a bi metal blade working at Degoose’s workshop, Larry demomstrated cutting a couple of rips from some timber and the results were very impressive. 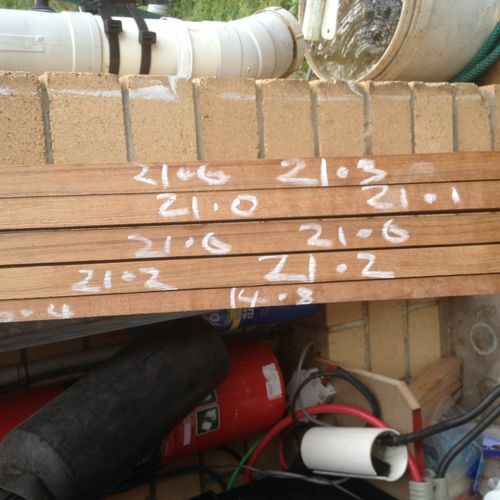 He cut two runs from a length of timber and produced very accurate results from his band saw fitted with a new Kreg fence. With this in mind I decided to try it for myself on my bandsaw, which BTW is notorious for cutting where ever it wants to, generally not where the operator wants it to go. 1×2240mm x 1/2” x 4 TPI and the other 2240mm x1/2” 12 TPI. The 4 TPI Blade is branded Starrett Intenss PRO-DIE 1/2” (13mm) x .035” ( 0.90mm) x 3/P then is smaller numbers showing 360295-07. The 12TPI has no markings on it at all. So I assume its a generic bulk saw blade cut to length to suit the customer. Due to the difference in thickness a complete re- adjustment of the saws alignment bearings and rubbing strips has to be done along with a readjustment of the tension to suit the width of the blade. 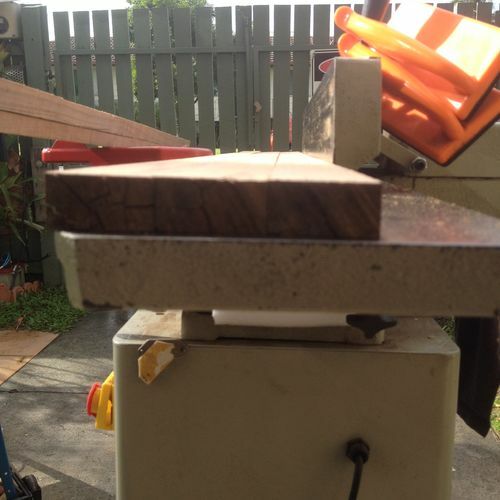 I have only fitted the 4TPI blade to the band saw at this stage. With the new blade fitted a freehand rotate was done to check for binding, all was good so it it was go at throttle up, at power on the saw ran normally and exibited no difference in its nornal free running operation. I had a piece of timber which had a twist in it which to remove would waste most of the timber so I chose to use it as a resaw test. The timber had been thicknessed and jointed on the edge, hence how I discovered the twist. I cut each piece, jointed the stock and completed another cut again repeating the process eventually finishing with five pieces, four at the required width and one a remaining off cut. Although I aded the additional process of jointing the timber in between cuts the blade performed on par to what I saw at Larrys shop. 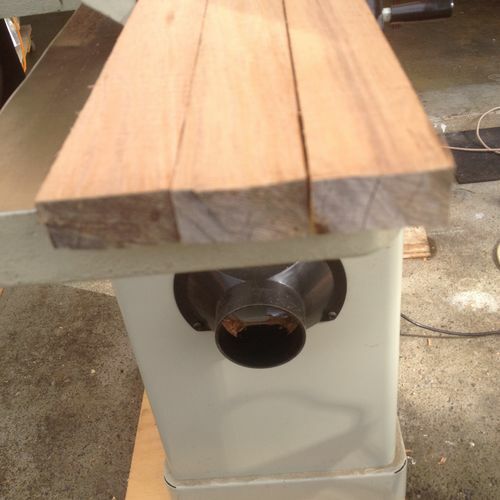 I placed three pieces on the jointer to check for physical accuracy. 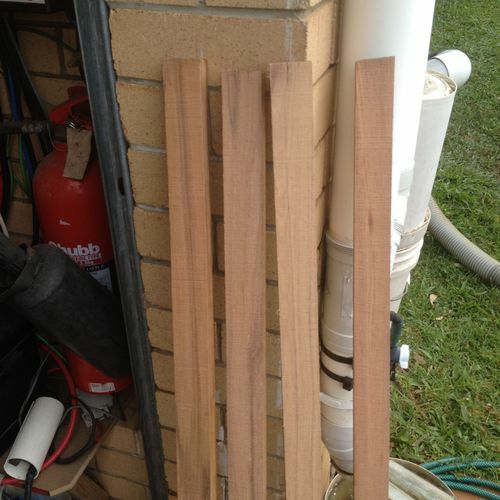 There is evidence of twist but the results are good enough for a cutting board glue up or the likes. 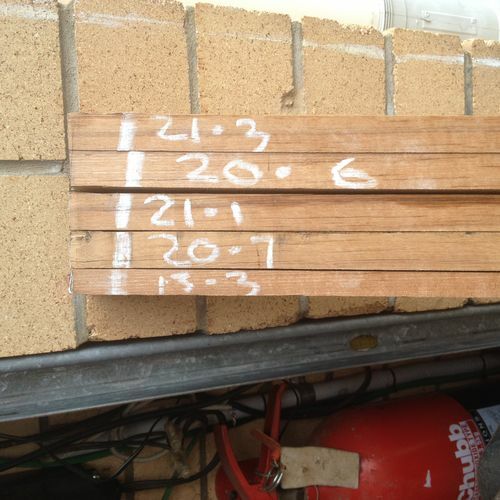 I then gauged up each stick at three positions, start, middle and at the finish of the cut, these are the results. Note: Pictures deliberately turned sideways for convienence, I havent had an earthquake !! A standard Bandsaw blade is about $14 -$16 each, the Bi meatal blades were $48 each, so investment wise its a substantial rise in capital outlay cost. The blades performance was certainly improved out of sight, in both accuracy and ease of cutting on the saw. Well its cost is certainly up there so an accurate assessment is to be determined as the blade is used and its life cycle can be assessed. But if its anything like HSS is to tungsten its a worthwhile investment. I too purchased a bi-metal resaw blade (Timberwolf) and will never go back to regular carbon blades. 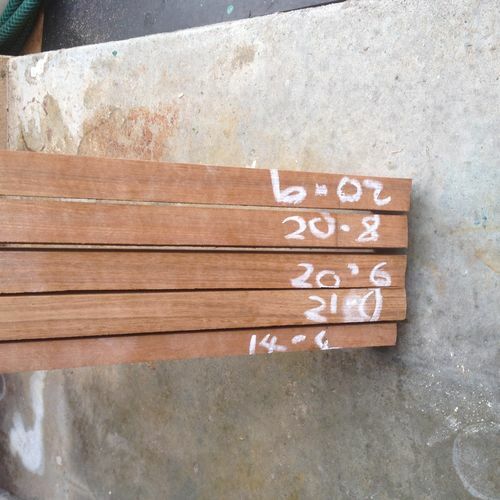 I use the 2/3 variable tooth configuration on very hard woods (Jatoba and Hedge) with good results. So far it seems to be staying sharp/straight longer than my carbon blades. My 131 1/2” was $70 so it needs to last longer! Thnx for your review and thoughts. I discovered Starrett blades a long time ago and that is all I use. I have not used the bi-metal ones, although I do have one on my metal cutting bandsaw. On my wood cutting BS, I have the Starrett “Woodpecker” 3T skip. The most notable thing about them is the weld; or the lack of. It is so perfectly welded, that you can’t see where it is welded. That makes for perfect running through the guides. I have mentioned them many times before, but no one seems to want to believe me. I’m glad you have discovered them. 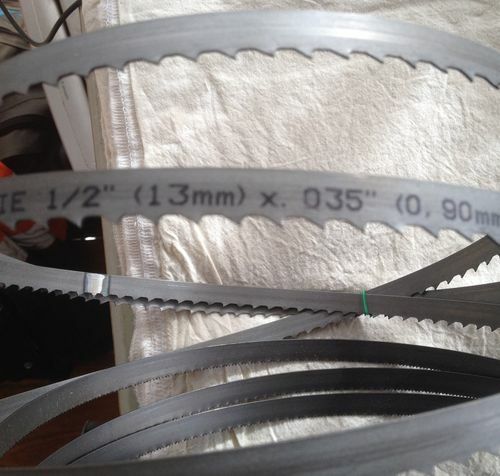 My local guy made me bi-metal band saw blades from reels of Leenox material. I think that I paid quite but lees that you paid for yours. Those bi-metal blades should last a long time Rob. I have a Starrett also and find it performs extremely well. 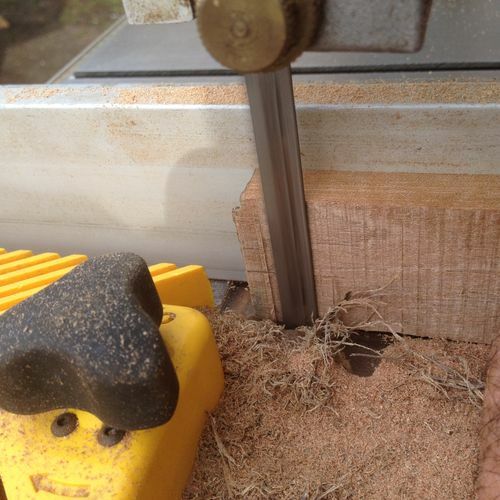 I have used the Woodslicer blades previously and while they work well, they don’t stay sharp very long. I’m hoping the Starrett will have a longer life expectancy.